Meet California’s statutory education requirement for new notaries with our online, California Six-Hour Notary Education Course. 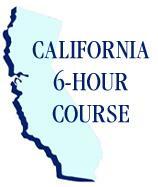 American Society of Notaries’ state-approved, California Six-Hour Notary Education Course provides extensive information on statutory requirements and best practices. It also covers the knowledge points that will be addressed in California’s mandatory notary exam. Immediately upon finishing the course and satisfying all information requirements, print your Proof of Completion certificate!